"The Miseducation Of Susan Ross"
In “The Miseducation Of Susan Ross,” the stock Scandal scene in which Quinn and Huck tape photos to the windows while hurling exposition is set to Sam And Dave’s “Hold On, I’m Comin.” According to TuneFind, which catalogues pop music cues in television shows, this is the third time Scandal has used “Hold On, I’m Comin.” It was first used in season one’s “Hell Hath No Fury,” then again in season two’s “Top Of The Hour.” There are scores of bouncy funk and soul tracks to choose from—the use of Foxy’s “Get Off” in “Pencils Down” was especially inspired—but Scandal keeps returning to Sam And Dave. That’s not an intrinsically bad thing, but in “Miseducation,” it only serves to highlight how repetitive Scandal’s storytelling has become. It’s practically impossible to do a heavily serialized drama for five seasons without repeating some of the same ideas, themes, or even actual stories. But with its campaign arc, Scandal is repeating all three at the same time. The show is striking a lot of familiar tones: the pain and damage wrought by a win-at-all-costs attitude, the psychic toll of crossing moral boundaries, and the all-consuming cynicism of establishment politics. On one hand, those are all the elements Scandal had at the peak of its creative success, back in season two’s Defiance arc. It’s exciting to see Scandal getting back to its roots, and with so little focus on Rowan, Jake, and the legacy of B-613, it suddenly feels like the show fans fell in love with. But so little of “Miseducation” is fresh or unique, it’s the type of episode that rewards come-latelies while giving diehard fans too little to chew on. Of course, there is a new coat of paint on Scandal’s view of presidential politics. The reintroduction of Hollis Doyle, one of the original architects of the Defiance debacle, lends the show some currency by mirroring the rise of Donald Trump. But the Hollis Doyle stuff is the definition of your-mileage-may-vary storytelling. As with “The Lawn Chair,” which I still haven’t cottoned to, the closer Scandal gets to real life, the less authentic it feels. The ripped-from-the-headlines approach works far better here than it did in “The Lawn Chair,” simply because the rise of a racist demagogue is a general idea even when it comes with the specific contours of the current campaign season. But it still forces comparison to the genuine article, which is far more terrifying, mean, and cynical than Scandal could ever dream of being. As anybody who watches Law & Order can attest, sometimes fictional TV riffs on the news are fascinating and illuminating, and other times they’re just goofy as hell. Scandal’s general lack of sobriety usually means its topical episodes land on the goofy side. Aside from adding Hollis to the fray, what story is Scandal telling that it hasn’t told many times before? 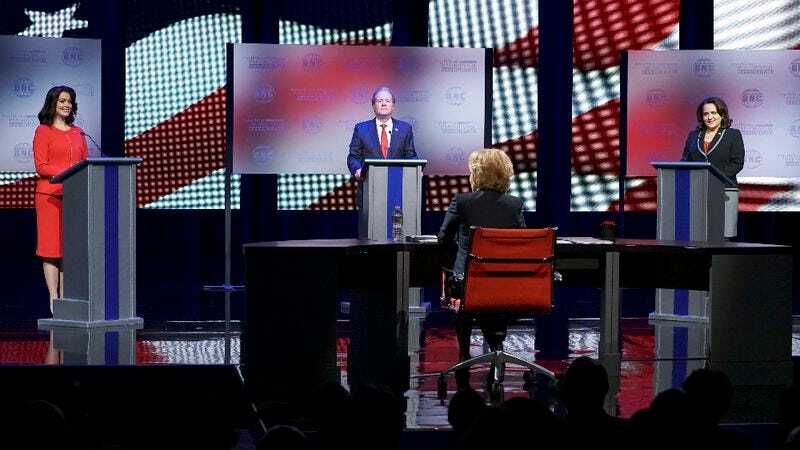 “Miseducation” picks up where “Pencils Down” left off, with the Republican candidates mixing it up in the debate, but it’s a two-person debate. Susan is too busy staring into the void, probably imagining David Rosen sleeping with other women. But after a presidential pep talk from Fitz, she wins the debate with a personal testimony about her late husband, who died during his military service in Afghanistan. The timing proves fortuitous for Olivia, who has just gotten a tip that Susan is lying about her husband, prompting OPA to go about digging up the real story in order to destroy Susan with it. As it turns out, Susan’s daughter was fathered by Ronnie, Susan’s high school sweetheart with whom she had a fling while her husband was serving. It’s exactly the kind of bombshell Olivia needs to sink Susan’s candidacy. The information prompts a lot of hand-wringing at OPA, with Quinn toeing the line while Huck threatens to revolt. According to the script, as long as Huck is unable to see his son, he’ll be sensitive to cases that hinge on potentially ruining someone else’s relationship with their children. That makes a certain kind of intellectual sense, if only because Huck has spent so much of the season watching Javi from afar. But how many people has Huck murdered? Maimed? Scarred for life, in both the literal and figurative senses? Huck turned over a new leaf in “No More Blood,” in which he brought on a stroke for then vice president Andrew Nichols rather than killing him at Elizabeth’s request. But by the end of the season, he was back to his old tricks, casually slitting the Lena Dunham character’s throat and killing a bus full of jurors to derail the B-613 proceedings. Huck hardly has the moral high ground here. Then again, neither does Olivia, which makes most of “Miseducation” downright confusing. The confusion started in “Pencils Down,” with Rowan chastising Olivia over her plans to leak damaging information about Edison to tank his presidential bid. He insists that she’s hurting someone who has only been kind to her, and doing so would push her over a line she couldn’t come back from. In “Miseducation,” the theme surfaces again. Huck and Quinn are horrified at the potential of Olivia going to the dark side, which sounds crazy to anybody who has watched this show for years, and seen Olivia return to the dark side over and over and over again. If the dark side was a frozen yogurt shop, Olivia would have visited enough by now to earn a free small cone with her loyalty card. That ship has sailed, so there’s no resonance to any storyline about the battle for Olivia’s soul. There is no redemption, there is no happily ever after, there is no jam-making in Vermont. If there’s a line that, once crossed, can’t be returned from, Olivia pole-vaulted over that line at least 40 episodes ago. It rings hollow, especially because the ultimate outcome is Ronnie committing suicide in jail rather than give into Olivia’s despicable demands, which prompts Olivia to decide she doesn’t want another Defiance. She wants to win this one fair-ish and square-ish. Meanwhile, Fitz is telling Susan to just come clean with the voters, admit she made a mistake, and plead for forgiveness. It’s the advice Olivia is constantly giving her clients, because it’s the same advice Judy Smith always gives her clients. It’s the exact advice Olivia gave to Josie Marcus in season three, when Josie was reluctant to admit that her “sister” was actually the daughter she gave birth to at a young age. It’s the advice she finally applied to herself earlier this season when she admitted to being Fitz’s mistress. Tell the truth, the strategy goes, and offer an explanation that sounds emotionally credible even if people disagree with the associated behavior. This is really more “The Miseducation Of Olivia Pope,” since Olivia is apparently trying to dumb herself down so Mellie can have an example to look to. The issue with the campaign against Susan isn’t that it’s ugly and mean-spirited, though it is both. The issue is that the scandal is one that could be easily defused simply by using one of Olivia’s foundational strategies. In the same episode, Alex Vargas gets inches away from Olivia’s face and tells her she’s terrible at negotiating, which based on the scene, is not a meritless claim. There is a line that Olivia can’t come back from once she crosses it, but it’s not about morality, it’s about competence. Once Olivia crosses that line, the thrill is gone. For Scandal to work, Olivia has to be good at her job, and the more the show turns over the same soil, the closer it pushes Olivia to that line. She should be able to do this stuff with a white hat over her face. I always enjoy a good Cyrus Beene takedown, even though the law of diminishing returns is at play. Alex was cruising for a bruising and it was nice to see his dirty tricks backfire, even if it was engineered by a far dirtier trickster. Olivia isn’t redeemable, but Susan certainly is, and it was a great choice to have Fitz come clean to her about Defiance. Though I doubt that decision will end well for Fitz. Is David Rosen’s entire purpose on this show to be Susan’s sham love interest now? For a sitting Attorney General, he seems to have a hell of a lot of time on his hands. The Marcus and Mellie plot was sort of cute. Marcus does indeed have a high booty. Thanks to Gwen for letting me pop in for the week. She’ll be back for next week’s shocking installment.